Join Steffi Oesterreich, PhD, Hannah Linden, MD with patient advocates Leigh Pate moderating and Joyce Bittinger introducing the presentation for an hour-long presentation at the Northwest Metastatic Breast Cancer Conference held in Seattle on September 23, 2017. 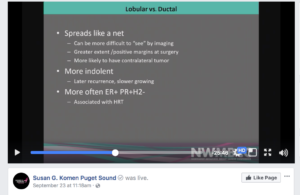 This presentation contains a basic overview of Lobular Breast Cancer with attendee questions and answers. On September 22-23, Komen Puget Sound welcomed patients and partners to the 2nd Annual Northwest Metastatic Breast Cancer Conference (NWMBCC). A free, open-to-the-public event held at Amazon Meeting Center, the NWMBCC was organized by breast cancer patients whose disease has metastasized (spread), giving patients and caregivers opportunities to learn from prominent breast cancer researchers and advocates. View the recorded livestream of the entire two day conference here.